Angus Fire will attend Canada’s only dedicated event for the global gas and LNG industries in Vancouver. Visit us on stand 73B. Angus Fire will be exhibiting at DPRTE, UK’s leading defence procurement and supply chain event in Farnborough on March 28th 2019. To find out about the latest fire protection products, visit us on stand 52. The instructors at the Fire Service College are being training on the CoolFire system. The CoolFire training programme will soon be available. Watch this space. 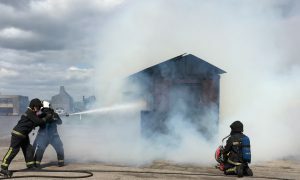 Following last year’s hugely successful programme Angus Fire and CFB Risk Management will be hosting further Firefighting Foam and Emergency Planning Schools next year. New dates will follow soon. To find out more, download the brochure. Adipec 2017 – Thank you. Thank you for visiting us on stand 8634, in the UK Pavilion at ADIPEC – The Abu Dhabi International Petroleum Exhibition and Conference – from 13-16 November 2017. It was great to see you there and we look forward talking to you again soon. Angus Fire will be exhibiting at the Adipec Exhibition in Abu Dhabi. Visit us on stand 8634, UK Pavilion, to find out about the latest firefighting technologies, foam concentrates and equipment. We look forward to seeing you there. Another busy show where the new CoolFire skid and the new AP2000 portable pump became the focus of attention on the Angus Fire stand. Thank you all visitors for stopping by. Please get in touch to for further information on the latest developments in CoolFire, pumps, foam concentrates and more. We are exhibiting at the ESS, Hall 5, Stand F13. To find out about the latest firefighting technologies, foam concentrates and equipment visit our stand, 20-21 September. We look forward to seeing you.